Just a virtual chick living my virtual life. What *IS* Willis Talking About? 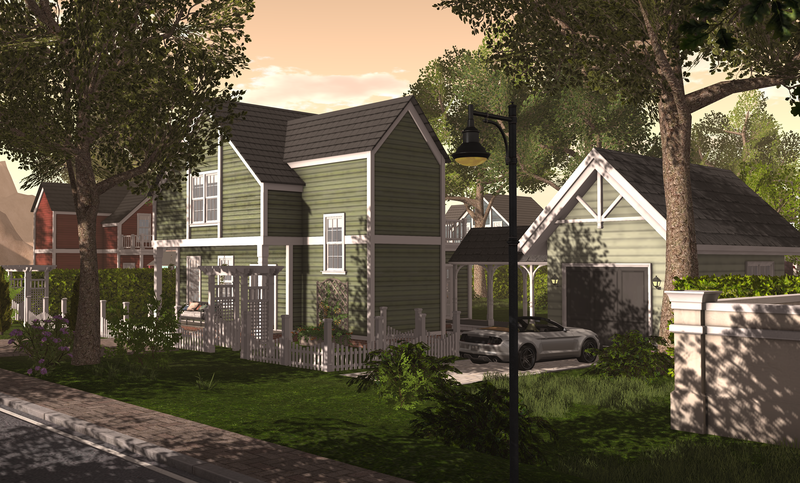 The new Linden Homes of Bellisseria are quite the buzz at the moment. 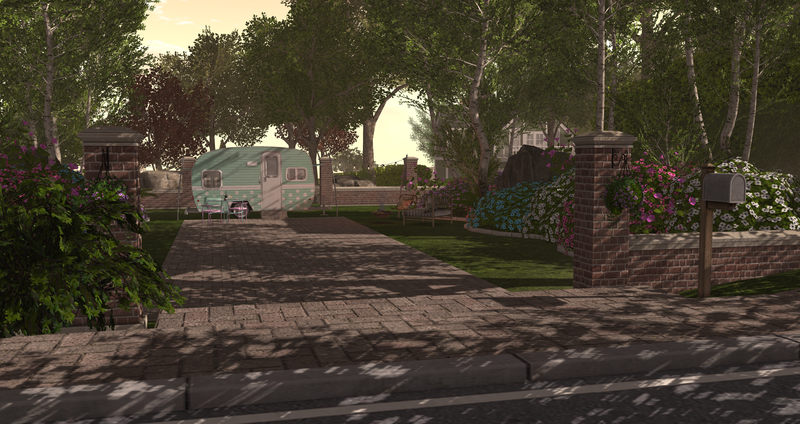 They were showcased at the 2019 Second Life Home & Garden Expo, and then went live. They feature traditional starter homes, and houseboats on 1024 plots available to residents with premium memberships. To read more about them check here. You can swap house styles any time you like by clicking your mailbox. I like that flexibility. 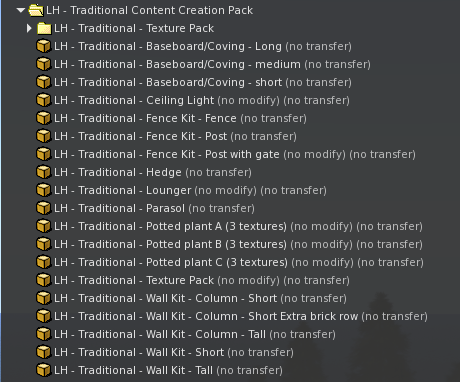 Additionally, they’ve included a folder of assets you may need like the street path texture to extend your walkway to your home, and maybe even use for a patio. Exterior walls and columns, interior wall textures, hedges, plants, are all nice to have. I used a variety of windlights on my exploration as they took place at different times, and also tried to find something that made it just feel visually amazing. It’s been fun playing with them here. I was lucky to even get a Linden Home, as they are proving very popular. I can see the charm immediately. It’s a neighborhood with a suburban feel. Streets connect everywhere so you can enjoy a leisurely drive, bike, or skate. Walks are nice, and they help you get out and meet new people. There are common areas and parks. There are beaches, and waterways for watercraft. 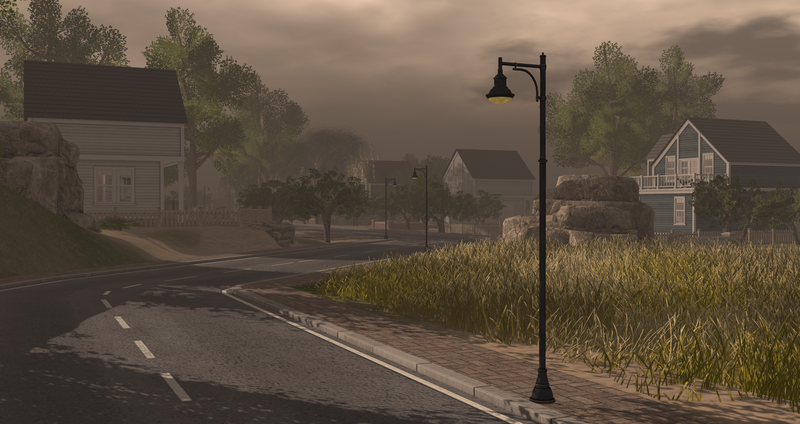 So the area is doing exactly what Linden Labs is hoping for –immersion. They are currently sold out, but you never know when someone might abandon one, so I would wait about a month or so. According to the wiki and signs around the community, more are coming soon. Additionally, the map shows another area to the far north that looks to be under development as well. From what I’ve inferred from the article, this may have a different look or style while retaining a neighborhood feel. Sadly, however my mailbox which controls the house had a script error and my house disappeared. So I’m currently camping on my parcel awaiting resolution on my support ticket. It’s happened to a few others as well and is a simple fix according to the forums. I’m patient, and having fun until then. I’m actually pretty lucky as while I have a neighbor on either side, to the back and across the street are parkland. I’m also a quick walk to the beach and houseboats, while still in a very greened hilly area. I can easily walk to the community pool as well. I’ve been spending a great deal of time wandering and motoring around the regions here. I’ve noticed some interesting things along the way. Sections while all having the same sets of houses, sometimes have a different feel based on street layout, amenities, terrain, and then personal esthetics of the residents. I’m particularly enjoying some of the long avenues, as well as the roundabouts. When I came over to visit Gogo, I walked around and found a roundabout section I fell in love with. The houses to the south of it were higher up in the hills so their view is of the roundabout and then downwards to the water. It’s very pretty, and instantly made me want to move in. The regions to the west and as they move south have a different feel than my own, and also completely different from the few regions I’ve visited over on the east coast. I’m really happy that they’ve created these hills and mountains and variation. If you are interested, the creator behind the Apple Fall brand has a home here, that is as of this post has an open house going on. You can enter and check out the home he’s decorated with his own creations, and very prettily landscape with his and others items on the outside. It’s interesting how he’s accented his roof peaks with Mesh Roof Truss Header By Kate McCridhe. My neighbor has installed the Dill Hurst Garage with Walkway from Roost which compliments the house styles here nicely. If you are a resident here and looking for solutions you might want to check their store out. I am very happy with my decision to move here. I highly recommend coming over and walking around the regions here to see if this something you’d like. I do have some things I would like to see changed like the public areas are deeded to a Linden public works group. It would be nice if you were a homeowner here to be able to be added to that group so you can rerez a car out when away from your parcel. Even with rezzing on a timed basis it would be nice to rez out a bbq and meal at the local park for an hour or so. There are ‘rezzing areas’…I just haven’t located them yet. I’m just saying it would be nice to rez my car out wherever I am, after getting out to talk to someone instead of locating one of these areas, going to it, then rezzing, and leaving. Also, yes, I know wearing wearable transportation is a workaround, but my Benz is a little classier than that thank you very much. I also have a concern as to how esthetics are able to be maintained. I’ve seen a few instances of some strange add ons that do not compliment the theme. Are we able to report them? Will action be taken? Some people have managed to beautifully blend some fantasy with reality (yes, you with mushrooms for trees, that was beautiful – well it was beautiful with the windlight I was using at the time). 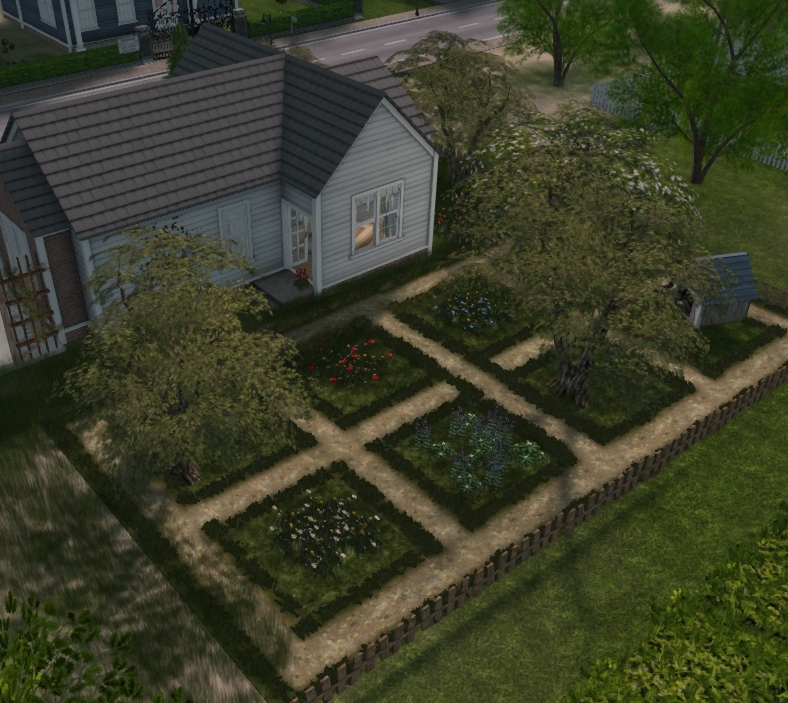 Some have just reduced their parcel to mainland hell (I’m looking at you with the prim you rezzed out for a garden wall and put an rl pastoral picture on it – think of your poor neighbors! They can’t even abandon and find a new place to escape you). Yes, I know, I can derender it, and even forever if it’s that offputting, but still, again, I’ve seen others deviate from traditional, but amazingly pulled it off well (aka the crime scene house). Another concern is, some areas the Moles have landscaped quite nicely, while others seem to be lucky they even have trees. I noticed many along the western coastline seem to have care taken to their common areas, and even sport additional walls along street corners. 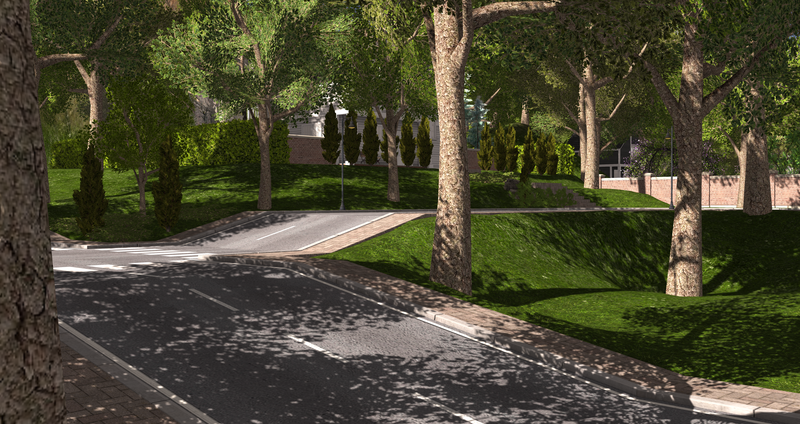 I saw a few sims with hardly anything other than some trees, leaving them very plain in comparison. I hope they revisit those areas for improvement. For example, West Allen has some street corners with a nice wall cornice with iron grates, Everfaire has lovely rocked, and grassy common areas. All these details generate atmosphere. Then places like Holliday, have that lovely 3 parcel lengths of the park, but only a rock cluster, a few bushes, and a bench. More rocks, more bushes, and benches would be nice. As I explore I am finding others with just lanes, perhaps there is something behind and in between the homes but it’s minimal. Also, some of the curved road bends are hard to drive over, there seem to be some physics issues with them. A note to my fellow neighbors — please take the time to explore. It’s fun to walk, bike, skate, and drive here. Many people are enjoying the waterways as well. It’s nice to see them out in the common areas. Don’t be a stranger if you see me out and about. Say hello! I’m not stalking you (yes I am – well really I’m checking out where to buy your dandelions), and will protect your privacy (honest! – by privacy I mean I won’t slurl to your house unless for a reason it’s of a public matter – like an open house), but I might showcase what an amazing landscaping job you did (what you got going on inside is your business not mine). Hair Fair 2018 has been open for a few days. Now is the perfect time to hit the fair and get new hair for your weekend plans! 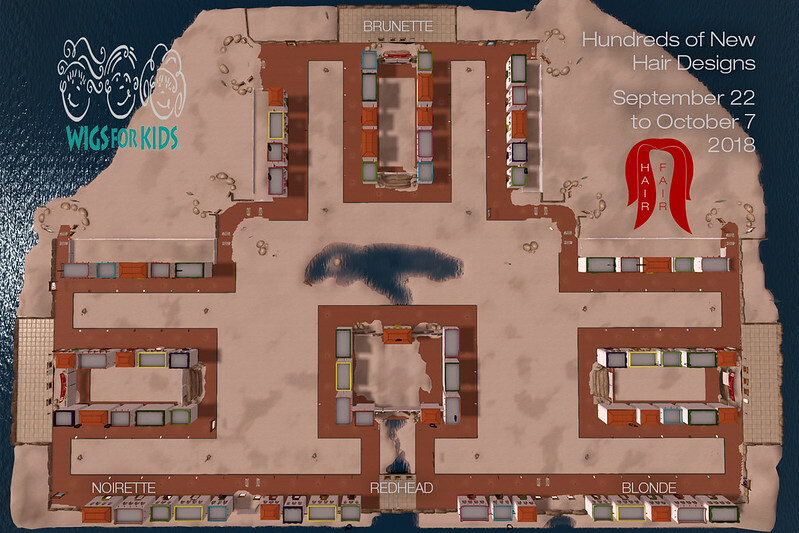 We hope you will join us from now until the 7th of October where all purchases from Hair Creators from all over Second Life will donate a portion to Wigs for Kids (minimum 15%) All bandana, Hares and Donation Kiosk donations are 100%. Hair Fair will open from 0.01am SLT 22nd September and close 11.59pm SLT 7th October. The list of Hair Stores participating in Hair Fair 2018 is below, as well as their releases exclusive to this event. The list is divided by Sim location. Slurls are included but direct teleporting is not available. 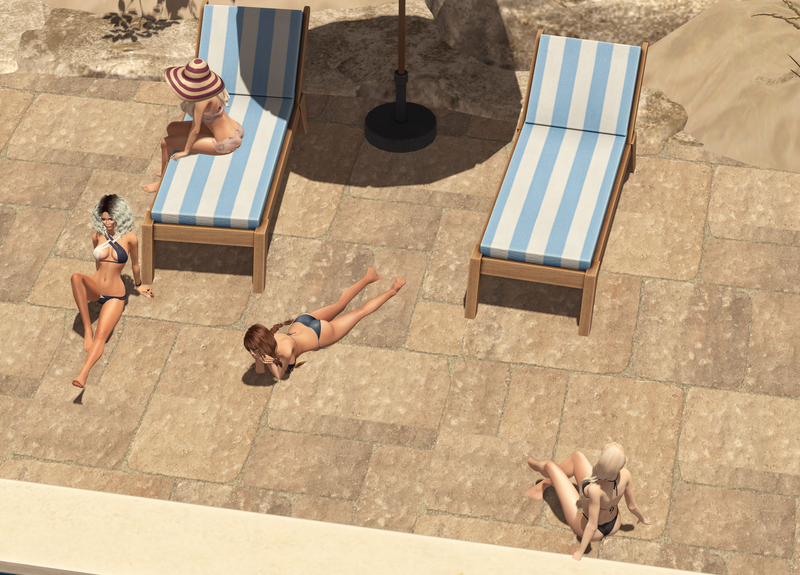 To use the slurls once at the location of the event, copy slurl to chat then right click and show on Map. This will give you a beacon to navigate towards. We do hope that you visit all the booths at Hair Fair as every creator has done their best to provide their best for this event. Donation amounts vary throughout the event, but all items do donate a minimum of 15% to Wigs for Kids. There are also Kiosks for direct donations, and Bandana Booths that donate 100% of all purchases. Each year the day before Hair Fair starts the participants send their demos to our demo group. This is so that you can spend a day trying all the styles in advance and know before you arrive what styles you want to purchase. It helps not only you have fun trying everything, but also decreases lag at the event, with fewer people trying on demos during. We urge you to join the group in world – secondlife:///app/group/2e30d166-f3e5-e2de-ff72-b3da2d06ded2/about – copy and paste into local chat to join. Or you can click the poster near our subscribo . List of locations to get your Raffle Ticket to enter are HERE you can enter each day for ten days, fresh new draw each day.